With a New Year, we often feel the need to ‘shake up’ our lives a little bit. Are you unhappy with your current job? Have you resolutely decided that in 2016 you’ll find employment? I know that the job hunt can be difficult and tiring –in fact I’ve just come out of it. Often the most challenging part comes when you step into the interview room and are grilled about your qualifications, personal attributes and ability to work with an already established team. So how can you prepare for a job interview? Now that I’ve been through the process, I have some idea of the strategies you can put in place to impress your perspective employer and manage your own stress. 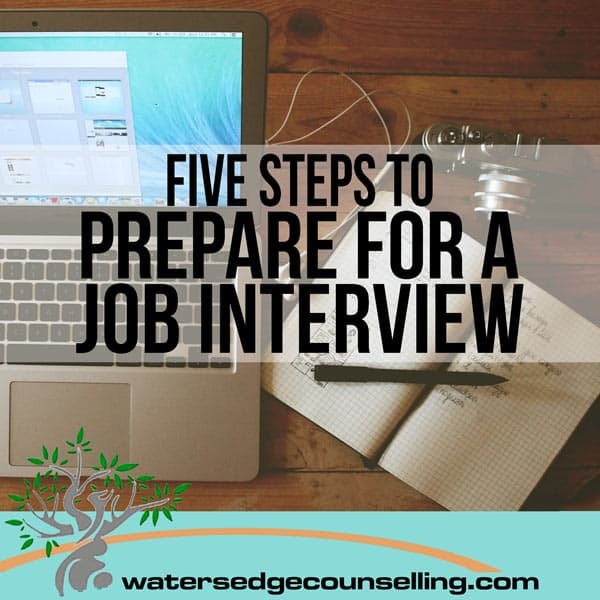 Here are five steps to help you prepare for a job interview. There is a plethora of information about your future workplace right at your fingertips and your interviewers want you to know it. Read back through the advertisement, taking note of the skills, expectations and attributes needed for the job. Browse the company website, making sure you have a sound knowledge of their mission and values. Even brush up on the history of the workplace and get an idea of their unique voice and how their message is portrayed. You need to embody this message, so allow your knowledge to inform how you answer questions. I know it’s cliché, but dressing in business attire really does make all the difference on a job interview. Trim you beard, style your hair and shower. Select clothing that is suitable like dress pants, a nice skirt or a tie. Clothing doesn’t have to be expensive, in fact you probably have something in the cupboard you can pull out and dust off. If you do need some nice shoes or a dress shirt, retail stores like Kmart or Target have some inexpensive options that will show your future employers you mean business. One of the reasons people struggle with interviews is because they are full of unknowns. We have no idea what the panel will ask or what they expect of us. The best way to overcome anxiety about this is to consider potential questions they may ask you and write down any questions you want to ask them. Think about the work environment and job description to formulate rough answers to questions. -and what specific skills you have for the position. Interviews are stressful and if you struggle with anxiety the process can become even harder. The morning of your interview give your self plenty of time to prepare. Have your clothes ironed and set out the night before and check how long it will take you to travel to the workplace. Little details like having enough petrol to drive there and knowing the bus schedule will make all the difference. Set yourself about 15 minutes before you leave to simply sit and practice your deep breathing. Recite a mantra to yourself such as “I am enough” and then arrive at the destination with time to spare. By doing this, you remain in control of the situation and are calm and centred when you enter the interview room. Let’s be clear, it is never a good idea to lie about your qualifications or experience on a job interview! There comes a time though, when you need to put your game face on and show your prospective employers you are the ideal candidate for the position. You will feel nervous and shaky, but speak with a confidence and ease that shows them you are competent. Be genuine and keep eye contact with them through the process, shaking their hands confidently when you enter and leave. Pretend to be assured, because when you do this they will see the positive qualities you will bring to the job. Do you need support as you look for a job? Duncan is a business coach and mentor who will help you define your goals. Contact him on 0434 331 243 for a FREE 10 minute consultation. If you are ready to book an appointment with Duncan, click the icon BOOK ONLINE NOW and you will be taken to his online appointment calendar, and follow the prompts.